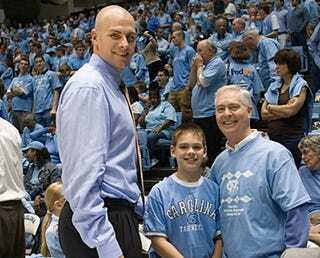 Eric Montross is Paying Hush Money For John Edwards's Love Child? Once a Tar Heel always a Tar Heel, I guess. Politics and sports make strange bedfellows. The John Edwards love-child affair hasn't really crossed over into the mainstream media because, honestly, I have no idea why it hasn't. Probably because most of the people who would be reporting on the matter have a love child themselves or are engaging in torrid affairs. But until now this salacious story has had no connection to sports. No longer. According to the fine folks at Radar, Eric Montross is Edwards's bag man. Why a multi-millionaire needs someone to pay off his alleged mistress and love child is anyone's guess. In a follow-up story published on December 19, the Enquirer reported that after word of the affair got out, Hunter moved into a home owned by an Edwards supporter in the exclusive Governors Club, a gated community less than five miles away from the Edwards HQ in Chapel Hill and only a few blocks away from the Young residence. So from here the report goes on to surmise that Montross is channeling money not only to Edwards's mistress but also to another man, ex-Edwards campaign manager, Andrew Young who claims to be the father of the baby. How much money? Tens of thousands of dollars a month. Whew. Makes you long for the day of bad flat-tops and Montross getting dunked on, right? Yeah, me too. So if you put money down on Edwards as Obama's running mate, yeah, you might want to consider that money lost. After all, there are two Americas—one where you can have an illegitimate child and afford to pay someone else to take the blame, and the other where you have to go on Maury and own up to your transgressions.